This was the flag of the Navy of Aragon from 1263 to 1516, four bars Gules (red stripes) on an Or (yellow) field. Previously, from 1096 under Peter I's reign, until 1263, the naval flag was Argent (white) flag with the (red) cross of St George and a blackamoor's head in each quarter, representing the four Moor kings defeated by Peter I at Acoraz battle (1095). The marriage in 1137 of Doña Petronila, daughter of the Aragonese king Ramiro el Monje, with Ramón Berenguer IV, Count of Barcelona, produced the merger of Catalonia and Aragon, and the kingdom adopted the flags of the Count of Barcelona. Historian Luis Sorando points out in this website that the pre-1137 flag cannot be considered a naval ensign of Aragon since this kingdom had no navy before that date. He also points out that it is not yet clear whether the yellow-red striped flag was originally Catalan or Aragonese. 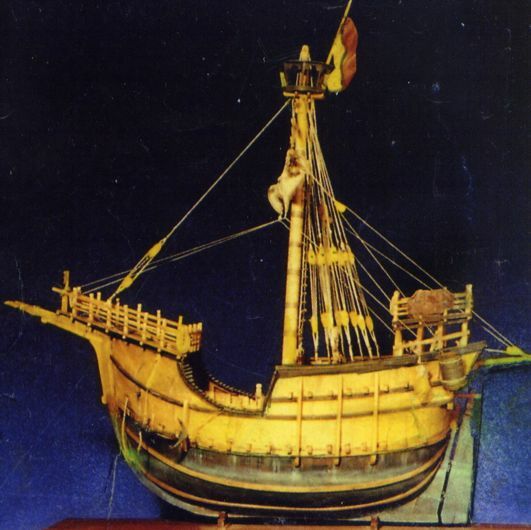 I would like to know which flag likely flew on the Coca de Mataró, an Aragonese ship whose model is displayed at Museum Prins Hendrik in Rotterdam. The reproduction naval ensign of the Aragonese kingdom at the time (not the one displayed in Rotterdam!) seems to be different.